MARK YOUR CALENDAR for the following meeting dates. Please be advised that our meetings are subject to change for a variety of reasons so check this website frequently or contact our President for more information. 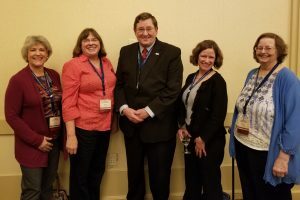 Jan 2018: PS-APG members who attended Salt Lake Institute of Genealogy, (L-R) Karin Coppernoll, Nancy Cordell, Steven Morrison, Karin Borgerson, and Claudia Breland. Feb 2018: The first PS-APG meeting for the year was held at the Tacoma Public Library. 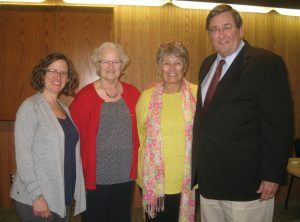 Members who attended the Salt Lake Institute of Genealogy (SLIG) shared their experiences. 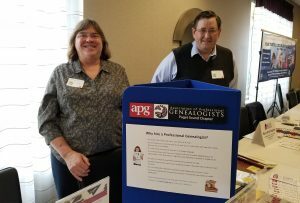 April 2018: Nancy Cordell and Steven Morrison at Tacoma, WA with the PS-APG booth. 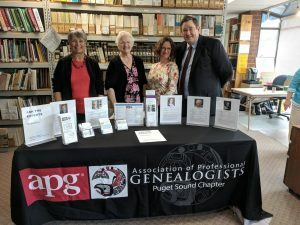 May 2018: PS-APG meeting held at the Seattle Genealogical Society. Reviewed plans for Ask the Experts in Seattle and Olympia later that year. Also, adopted revisions to the proposed bylaws, requested by National. Aug 2018: PS-APG ‘Experts’ @ SGS (L-R) Jill Morelli, Janet Camarata, Karin Borgerson, and Steven Morrison. Not shown Claudia Breland. Aug 2018: Ask the Experts @ Seattle Genealogical Society (SGS). 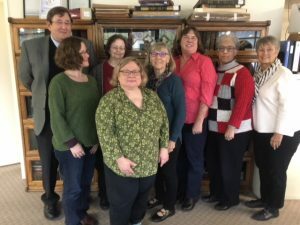 Five PS-APG experts provided 20-minute consultations for thirteen SGS members who were challenged with genealogical roadblocks. Sept 2018: PS-APG meeting held at the Heritage Quest Research Library in Sumner, WA. Summary of failed attempt to electronically defraud the Chapter. Review of Ask the Experts in Seattle. Final technical adoption of revised bylaws. Chapter elections of President and Treasurer the deferred to December meeting. Presentation by Nancy Cordell on DNA. Feb 2017: The February PS-APG meeting was held at the Seattle Genealogical Society, in Seattle. Following the chapter business meeting, attendees watched Tom Jones’s opening session from the 2016 Professional Management Conference. Apr 2017: The April PS-APG meeting was held at the Tacoma Public Library – Northwest Room. Following the chapter business meeting Claudia Breland presenting her DRAFT program for the NGS conference “Case Studies in DNA”. 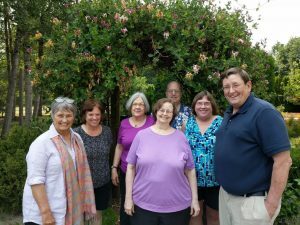 Jun 2017: The June PS-APG meeting was held Saturday, June 10 at the Fiske Genealogical Library in Seattle, WA. PS-APG EXPERTS at PSGS – Aug 2017 (L-R) Karin Borgerson, Janet Camarata, Jill Morelli, & Steven Morrison. Aug 2017: Ask the Experts @ Puget Sound Genealogical Society (PSGS) – Bremerton. 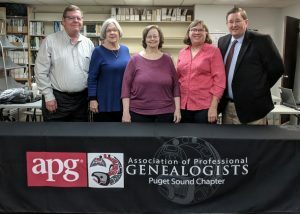 Four PS-APG experts provided 20-minute consultations for twenty two PSGS members who were challenged with genealogical roadblocks. Aug 2017: The PS-APG picnic was at the home of Steven & Gloria Morrison, in Olympia, WA. Oct 2017: The October PS-APG meeting was held Saturday, October 14 at the Heritage Quest Research Library in Sumner. 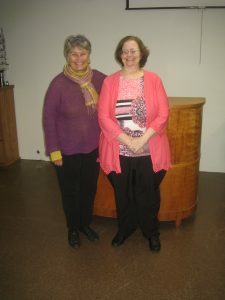 Jill Morelli and Claudia Breland presented on their experiences writing for the National Genealogy Society Quarterly. Dec 2017: Holiday Gathering @ SGS (L-R) front row – Caroll Bundy; middle row – Karin Borgerson, Claudia Breland, Trish Hackett Nicola, Nancy Cordell, Janice Lovelace, Jill Morelli; back row – Steven Morrison. Dec 2017: The December PS-APG meeting was at the Seattle Genealogical Society. New by-laws were adopted by the members. It was our Holiday Gathering with special eats and beverages. Copyright © 2019 APG Puget Sound Chapter . Powered by WordPress. Theme: Spacious by ThemeGrill.